Square-Enix is coming back strong into the MMO space this year with Final Fantasy XIV (FFXIV), an updated sequel to its first foray into the genre. I got a chance to sit down with the game at this year's E3 show in Los Angeles and experience the new world, improved battle system, and streamlined controls. What's got me most excited, you ask? The impressive tech demonstration using nVidia's 3D Vision created an immersive MMO world that's unlike anything I've experienced. If there's one genre that doesn't need the extra boost in immersive environments, it would be the MMORPG space. Games like World of Warcraft and Everquest have proved that MMO developers are more akin to digitized drug dealers than simple entertainment engineers. But when I took those first 3D steps into the world of Eorzea in FFXIV, I felt that 3D and MMOs were destined for each other far more than any racing or FPS game could ever hope to be. As I walked across a wooden bridge in one of the towns I was able to look down below hundreds feet into the rest of the city, giving the area a feeling of depth and tangibility that qualitatively enhanced my environmental experience. And unlike a fast racing game or shooter, the pace of the MMO genre meant that I could move through the world slowly and deliberately, taking in every bit of architecture at my own pace. Square-Enix was coy about officially announcing 3D functionality in FFXIV, claiming that the tech demo at E3 was available merely to gauge interest in the possibility. 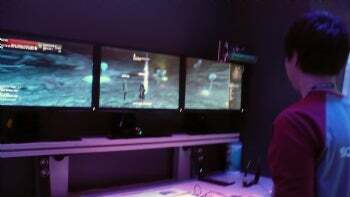 The numerous 3D stations set up with three landscape monitors, however, suggested that they were taking this demo quite seriously. The release of FFXIV on the PS3, a strong proponent of 3D tech, further reinforces that we'll be traversing through Eorzea later this year in full 3D glory. You'll still need glasses and a powerful system (you can benchmark your system for FFXIV on the Final Fantasy Website), but if you get the chance to check this out in 3D for yourself, I'm sure you wouldn't want to play the game any other way.